The process of applying color is to the fabric in definite patterns or designs in the textile screen printing business. The color is bonded with the fiber in properly printed fabrics that can resist washing and friction. As it refers to the production of designs of any kind, it could not be made on textile fabrics by normal weaving/knitting techniques. In order to improve its attractiveness and marketability, textile screen printing is generally done on finished fabrics, curtain, clothes, ladies dress materials, bed sheets etc. Also, it’s a lucrative endeavor to start your own textile screen-printing. If you produce customized imprinted T-shirts, banners, bags etc then you can sell them to businesses, schools, nonprofit organizations, sports leagues and a variety of other industries. While other companies may use them for branding, retail shops resell their personalized items for a profit. There is a strong market for small jobs big companies don’t want because everybody loves t-shirts etc, which are the part of the textile screen printing business. Also, if you use a very small space then you can earn hundreds of dollars an hour right in your own home. And you only order and print what the customer has actually ordered as a middleman. The chance to be your OWN BOSS! If you want to make quality prints that look sharp and last through a number of laundry cycles then it’s important to develop the skill of screen-printing. And before you sell your first item you need the proper amount of training and practice. Although starting a business requires dedication, it doesn’t have to be boring or complicated. But, you should be able to start setting up your own company as long as you have the desire and a good guide on what to do. That’s why there’s a great guide you can follow if you’ve been thinking about pursuing your passion and creating a custom fabric printing shop. Although before you even start creating your products, there are plenty of questions you need to answer, these are the crucial ones. There is a multitude of goods you could offer in the custom fabric printing world. These are all possible items you could sell from printed caps, customized t-shirts, even printed wallpaper or textile fabrics. Also, you should know which market you want to target while setting aside capital for the project is vital. This is because it’s a good idea to draft a business plan that will include as many details as possible. If it comes with more specific then it will be easier to envision your plans and achieve your goals. There has been a big shift to semi-automatic and now fully automatic printing machines from a predominantly manual printing process in the last decade. Also, there is a chance to set up an automatic and large-scale textile screen printing unit that will allow versatile sizes and quality of fabrics to print. Moreover, you can print any types of fabric including saris, clothes, bed sheets and textiles while using this type of printing unit. From the preparation of printing paste to the printing of fabric, fixation of dyestuff by curing/steaming, washing off, calendaring, folding and packing, there are different steps involved in the printing process. It’s inspected to remove any objectionable faults and stretched evenly on a printing table for scoured and bleached cotton fabric as obtained from dealers. And the dye paste is pressed over the screen by means of rubber squeezer on the screens containing the designs are placed over the table. It’s depending on the construction of basic cloth to be printed and their end users, the selection of dyes and gums. Moreover, the printed clothes are cured or steamed for the fixation of the color after printing. Later remove loose dyestuff by a thorough wash. After that, the products are ready to calendar, fold, and pack for the delivery. After deciding to take up t-shirt printing, it’s important to develop unique designs unlike those already in the market. Now, you need to find out what kinds of textile inks you would like to use for printing purpose. Because they are environmentally friendly and they leave the fabric soft instead of leaving a hard, plastic feel, water-based inks are generally favored. Also, when you advertise or market your item you can use the fact that you print with this eco-friendly ink as a selling point. Apart from the competition, it’s a great way to set your business. And you can start establishing a relationship with manufacturers and suppliers for the raw materials you need if you’re thinking of printing items in bulk. If you want that people should know about your textile screen printing business then you must start marketing. In this case, you should highlight the benefits of buying your item versus that of the competition. Also, if you feel your knowledge about the subject is insufficient then you can hit the books or enroll in a marketing class. Moreover, you can start blogging regarding your products. 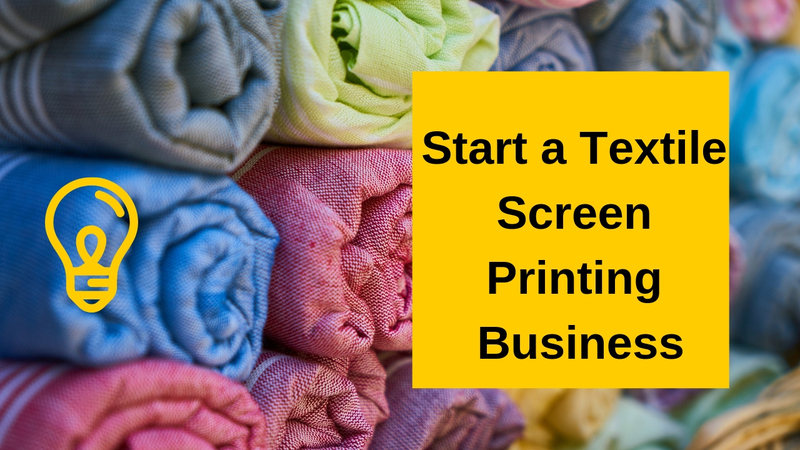 Although the above said steps are most essential, there are some other important steps to follow while starting a textile screen printing business.